The 5300-odd rankers in the AIPG were breathing a sigh of relief when the notification for counseling for Post Graduation seats was declared, along with dates and ranks and the rank cards were uploaded on the site. It seemed that the concept of online counseling which seemed innocuous on the surface but was fraught with worrisome issues at the core was held at bay for this year at least. Which brings us back to square one. The Supreme Court has relented and online counseling is being held for this year for the Post Graduation seats. 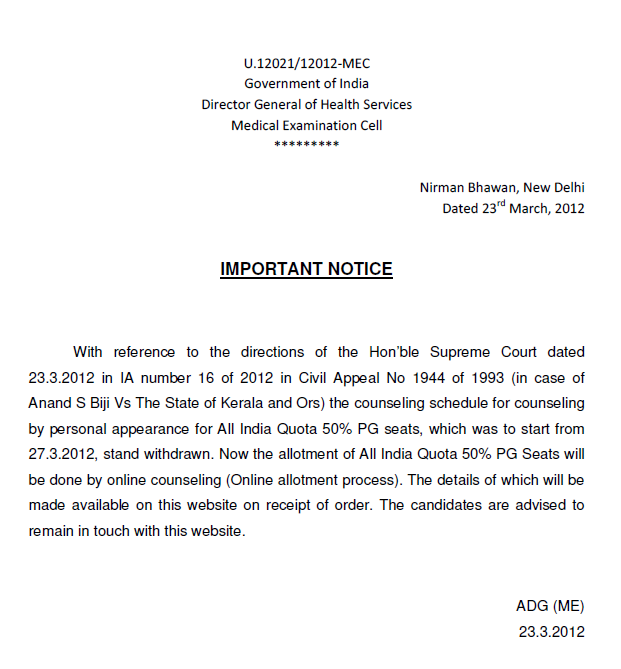 The issue of Online counseling for the MBBS Entrance exam has, however, been canceled. Usually I am an early adapter when it comes to technological things. I am a vociferous supporter of taking things to the clouds and generally making things easily accessible. So, the question is why is a guy like me, an internet-addict, on the warpath as far as this notification is concerned? After the fiasco of the Rajasthan entrance exam (read this to get your guts wrenched), one can hardly blame the students if they get worried at the mention of online anything. There are very legitimate worries about the state of affairs and the transparency of the whole system. While it would be hypocrisy to criticize the system without having even tried it out once, it still remains an issue of severe worry for a lot of us. What if some of the seats are “digested”? What if there are issues in the servers? What if some corrupt official decides to play truant (its not like MCI is the House of God, if anything, its quite the opposite)? One of the major worries, especially for people holding ranks 2000 and beyond is the seat blocking by people of higher ranks. The system is supposed to give us a number of choices and we are to fill in our stream and college of choice. Now we will be allotted a provisional rank for every choice we make. Depending on the number of people who confirm or reject the same seat, my rank will either go up or stay the same. Now depending on the number of seats left, we make our choices. The worry is, if the frontrunners do not make their choices early, there will be blocking of seats and the people who rank lower in the list shall not be able to find their discipline of choice. It may so happen that until and unless the people who have ranked before one have made a clear option, the choices left at hand shall not be very clear. And when our lives and careers are at stake, it becomes a talking point indeed. One can only hope that there is some sort of a filter that compels people to make a confirmed choice so that there is no seat blocking. In view of the above problem, if one does not make a few “soft” fall back options (subjects like Anatomy and Forensic Medicine in really crappy places that are unlikely to be opted for by anyone) available, they may end up empty handed once the whole business is done. What is worst is that one may end up foregoing a discipline of their choice if they have not enlisted the proper combination in their choices. The problem with online counseling for medical post graduation vis-à-vis any other examination (they were comparing it to the AIEEE, the morons!) is the infinite number of permutations and combinations possible. There are 33 disciplines to do Post Graduation Degree (MD or MS: Last year’s seat break up) in and there are 34 disciplines to do a Post Graduation Diploma (Superior to MBBS, inferior to MD/MS: Last year’s seat break up). That makes a total of 67 options. Now there are 121 Institutes that offer PG seats and although not all of them offer degrees/diplomas in all 67 disciplines, still the permutations and combinations possible is mind boggling. When we had counseling by personal appearance, there was the chance to see for ourselves what options we had before choosing. In an online scenario, with everyone choosing asynchronously their discipline of choice, it becomes very difficult to get something we want. The system has not been declared but one of the fears doing the rounds is that there is a possibility that if someone confirms a discipline of their choice in a college of their choice before others, they may get lucky with it, provided that guys who have ranked before him have not confirmed their choices. Now, only if the system allows me to choose and confirm after ALL the people ranked above me have made their final choices and confirmed it, the risk of a “first come first serve” bias will be minimized. Also, in that case the problem of seat blocking shall also be ameliorated. Tags: AIPGMEE, Counseling, Exams, Medical Education, Medical School, Medicine, PG, PGMEE, postaday. Bookmark the permalink. While I am all for embracing new technology, I am more than sceptical about the online counselling for AIPG. My biggest fear has been corruption. I was completely in the dark about the procedure. If the design is really poor designed like you suspect, this can be really frustrating!